Let me start this review off by saying that I still believe the first Mission: Impossible film directed by Brian De Palma to be the best of the franchise, but this latest entry, Mission: Impossible – Fallout is a contender for the best action-packed entry since the franchise, starting with the second film, abandoned the slower paced spy-thriller style it began with. This outing is sort of a culmination of all the films that came before it, bringing together the core characters from the M:I franchise, Tom Cruise and IMF agent Ethan Hunt and his team of Ving Rhames as Luther Stickell and Simon Pegg and Benji Dunn. The team must recover a trio of stolen plutonium cores from an international terrorist, John Lark, before they can be used to create nuclear weapons by rogue terrorist. Meanwhile, Ethan must work against an old ally and align with a mysterious, wealthy philanthropic woman known as The White Widow (Vanessa Kirby) so he can recover the cores, but her price her a high one – she’s demanding he break out and hand over a well-known British terrorist wanted around the world. Mission: Impossible – Fallout is edge of your seat action from start to finish. In the hands of another director, the insanely over-the-top action sequences may seem like self-parody (anyone remember Pierce Brosnan snowboarding over the side of a cliff on a car door? ), but Christopher McQuarrie, who has only directed four feature films, three of them starring Tom Cruise, seems to know his subject well and there’s an obvious rapport here. By the time we get to the finale with the helicopter dogfight, full suspension of disbelief has been achieved and your pulse will be racing fully. Tom Cruise and Henry Cavill in Mission: Impossible - Fallout (2018).© 2018 Paramount Pictures. All rights reserved. 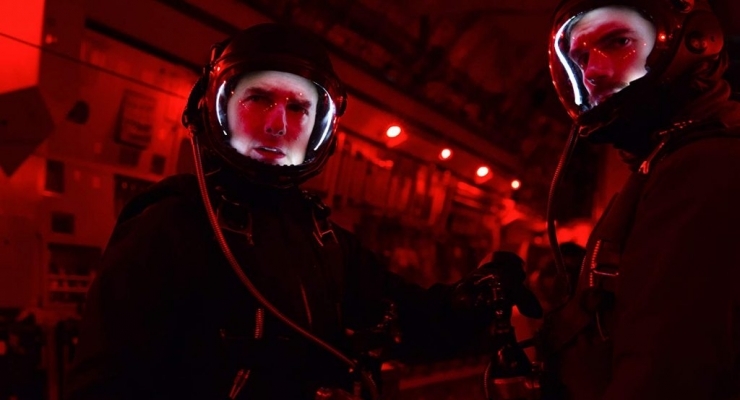 Mission: Impossible – Fallout was shot on various Arriflex and Panaflex cameras on 35mm Kodak Vision3 50D 5203, Vision3 200T 5213, and Vision3 500T 5219 film stock and the Red Weapon Dragon at 6K resolution. It was mastered at 4K with Dolby Vision HDR and arrives on 4K Ultra HD in an HEVC 2160p (4K) encodement with Dolby Vision framed at 2.39:1. This is a beautiful looking transfer that is filmic and free from noise, aliasing, or edge enhancement. Shadows are good, although some scenes with slight crush to pop up. The wider color gamut and dynamic range result in a beautiful array of colors to be seen in things like flames and superb ‘pop’ in headlights and the sheen on automobiles even in the daylight. The Blu-ray loses a bit of the crispness of the 4K disc and reds and oranges look a bit flatter due to the lack of the WCG of Dolby Vision (or HDR10 of that’s how you may be watching), but it’s still a strong-looking disc that is clean and nicely nuanced. Mission: Impossible – Fallout comes with a rollicking English Dolby Atmos audio mix that is bound to shoot straight to the top of lists for showpieces. The overhead channels carry lots of action from the “voice of god” effects in the early part of the film as Ethan and August are preparing to jump from the plane, to the sounds of the helicopters in the edge-of-the-seat finale. Dynamics are excellent, and clarity of the dialogue is superb, other than one scene where dialogue was purposely dropped below the sounds of music and crowd noise for artistic effect. This will also be a mix that people who love bass will flock to. Mission: Impossible — Fallout comes packed with special features including three audio commentaries and a bonus special features Blu-ray with a detailed making of documentary, deleted scenes and more. There’s also a collectible booklet, Stunts: Raising the Bar. Mission: Impossible — Fallout is pure popcorn entertainment at its finest handled flawlessly. It’s bold in its use of unbelievable action sequences, but it revels in them and manages to avoid becoming absolute comedy. This 4K Ultra HD release is a satisfying reference release that is sure to provide some pure home entertainment joy. 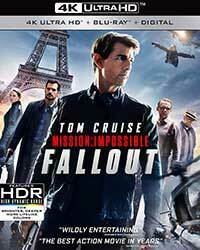 Ethan Hunt and his IMF team must work quickly to recover a trio of stolen plutonium cores from a terrorist while working with a mysterious woman helping to facilitate the exchange with a courier and against an old ally who has a conflicting mission in this action-packed, supercharged entry in this long-running franchise. The 4K Ultra HD with Dolby Vision and Atmos is instant home theater bliss.